COPENHAGEN, / STOCKHOLM - Around 1,300 Danes marched through Copenhagen on Wednesday in protest at a new ban on the wearing of Islamic veils and other face coverings in public spaces. Human rights campaigners have slammed the ban, accusing the government of infringing on women’s rights to dress as they choose, while supporters argue it enables better integration of Muslim immigrants into Danish society. Under the new measures wearing a body-length burqa, which covers a person’s entire face, or the niqab veil, which only shows the eyes, in public will lead to a fine of 1,000 kroner ($156). The ban also targets other accessories that hide the face, such as balaclavas and false beards. Repeated violations will be fined up to 10,000 kroner. Protests had been planned in the capital Copenhagen and the second-biggest city Aarhus late Wednesday as the controversial law came into force. The protesters, many wearing a niqab or burqa, marched from the central, left-wing district of Norrebro to Bellahoj police station on the outskirts of the capital. They formed a human chain around the station and then marched back to Norrebro before dispersing. Demonstrators, many with children in tow, chanted “no racists in our streets” and “my life, my choice” during the three-hour rally. The marchers included non-niqab-wearing Muslim women and non-Muslim Danes with faces covered. No incidents were reported, and a spokesman for the Copenhagen police said they did not plan to fine protesters who had violated the ban. 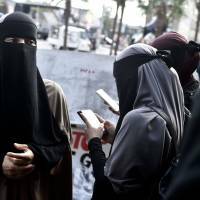 “We need to send a signal to the government that we will not bow to discrimination and a law that specifically targets a religious minority,” said Sabina, 21, a niqab-garbed student who asked that her full name not be used. She is one of about 150-200 Muslim women — 0.1 percent of those in the country — who wear either the niqab or burqa garments daily. Muslims account for around 5 percent of Denmark’s 5.7 million population. “I don’t think there are many who wear the burqa here in Denmark. But if you do, you should be punished with a fine,” Poulsen was quoted as saying by Ritzau news agency in February, when the government presented its proposal for the ban. Born and raised in Denmark by parents who emigrated from Turkey, she has worn the niqab since she was 18. “I’ve realized that democracy doesn’t work. Politicians boast of freedoms and rights when they are making fun of Muslims and when they are drawing caricatures of the prophet. But when it comes to me, they take away my right to choose how I want to dress,” she said. Instead of enabling Muslims to integrate Danish values, the ban risked having the opposite effect of increasing segregation, Sarah said. Amnesty International on Wednesday condemned the law as a “discriminatory violation of women’s rights,” especially against Muslim women who choose to wear the full-face veils. “If the intention of this law was to protect women’s rights it fails abjectly. 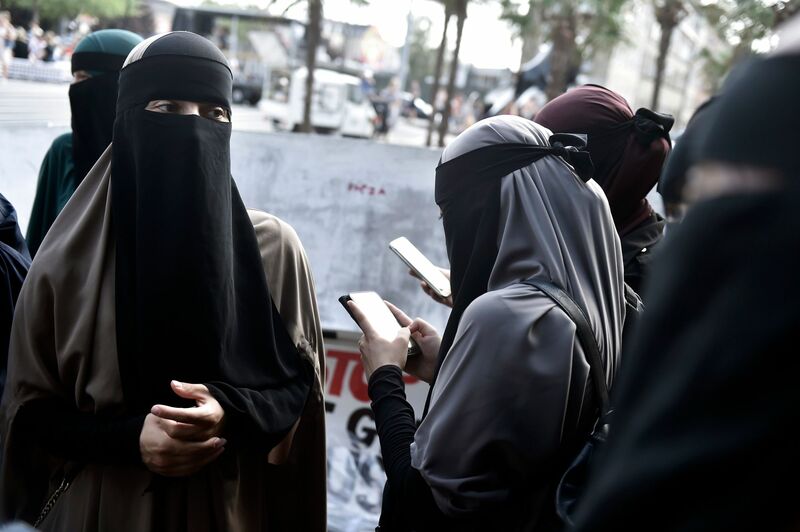 Instead, the law criminalizes women for their choice of clothing — making a mockery of the freedoms Denmark purports to uphold,” Deputy Europe Director Fotis Filippou said in a statement. “Whilst some specific restrictions on the wearing of full face veils for the purposes of public safety may be legitimate, this blanket ban is neither necessary nor proportionate and violates women’s rights to freedom of expression and religion,” he added. France was the first European country to ban the niqab in public places, with a law that took effect in 2011.